All of the new Lawn Fawn collection is available in the store right now - woot! 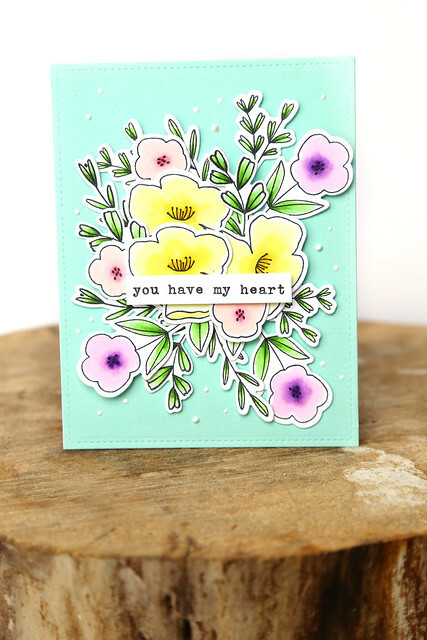 Kelly Marie re-created this card on the LF blog yesterday. I love it when she does that, it's fun for me to see someone else craft my design. 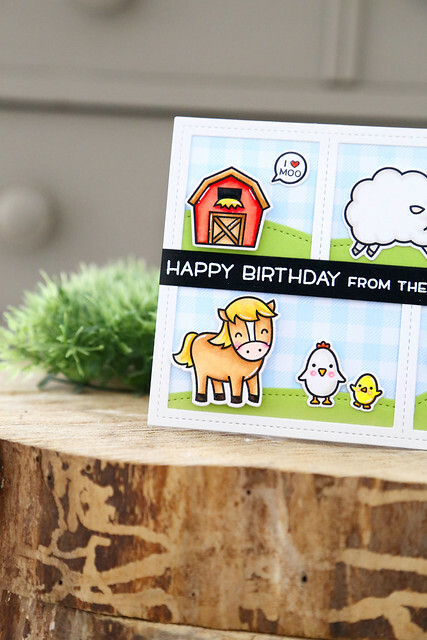 I used the new Hay There stamp set, and the Peekaboo backdrop. The sky is Gotta Have Gingham. 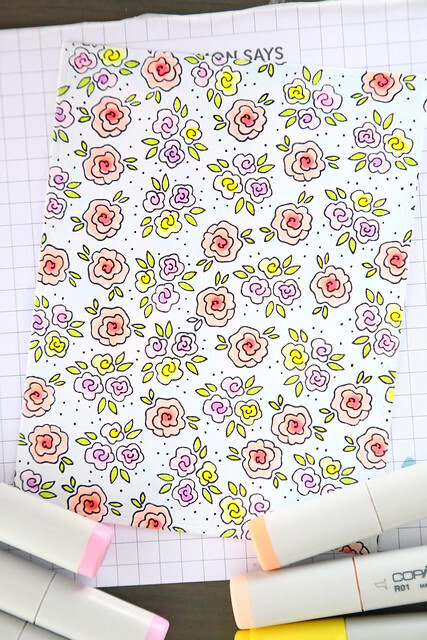 I can't stop using that paper pad - it's so soft and perfect for spring. That horse with the blond hair, though... haha. diva. I hope you like it! 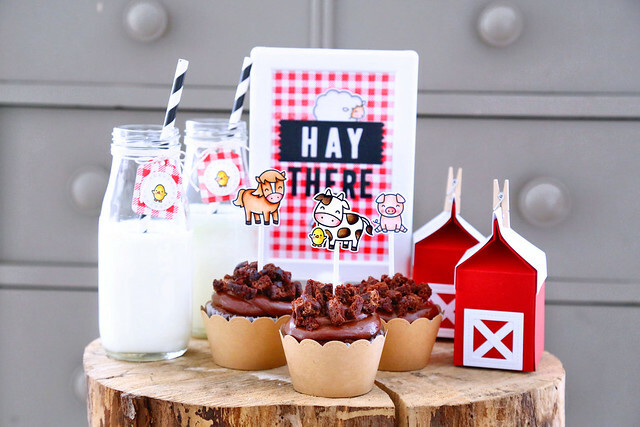 Make sure to check out the list of inspiration week winners on the LF blog this morning - click! 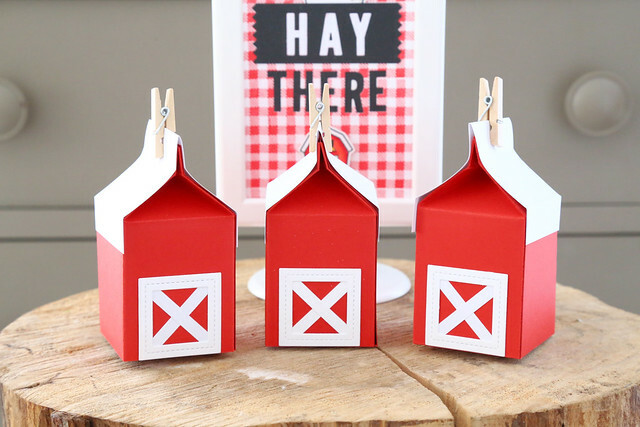 Welcome back to more of this month's Lawn Fawn inspiration week. 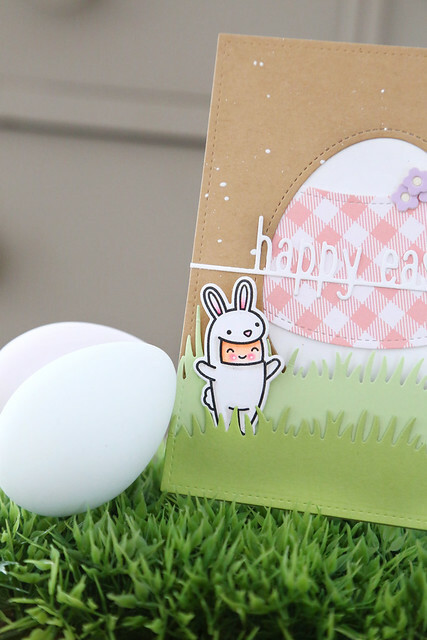 Today, we're showing off the Easter Party stamp set, as well as the Outside In Easter Egg Stackables dies. I love this little bunny-costume-kid so much! It's my second time using him this week. I'll use the others soon, hee hee. 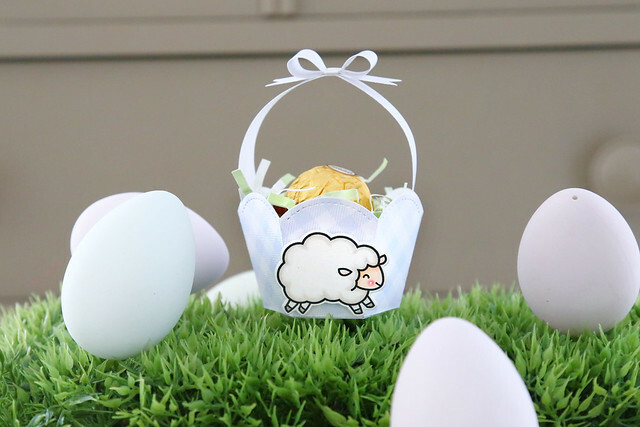 I nestled the bunny into some grassy hills and placed him in front of a giant easter egg. 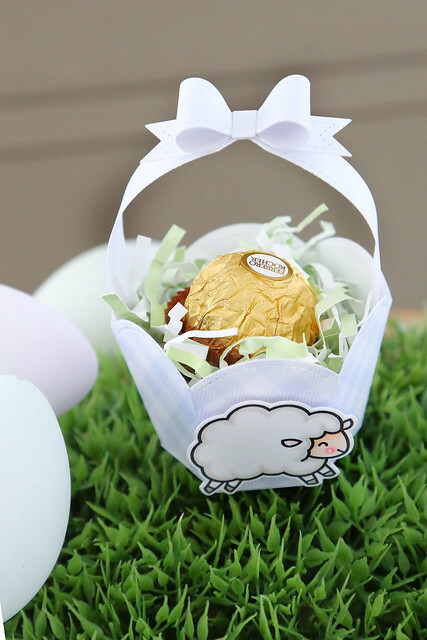 I used the negative space from an Outside In Easter Egg, and created a gingham egg sleeve. 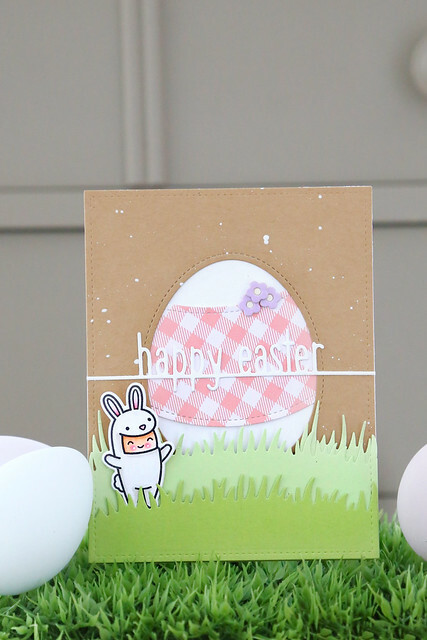 To finish off, I opted for the Happy Easter Line Border as the sentiment, and splattered white paint over the kraft card-front. 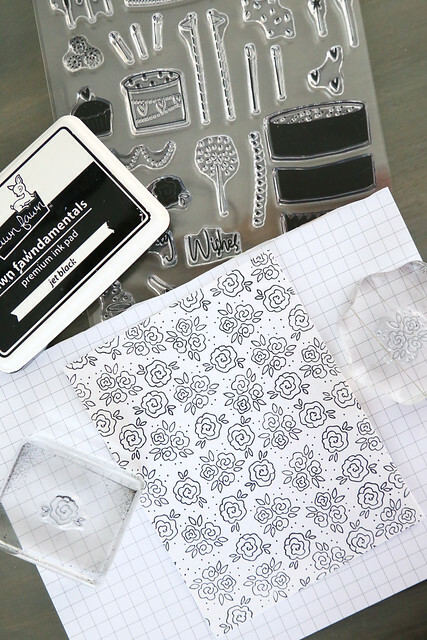 I'm excited to be joining Pinkfresh for an entire blog hop devoted to showing off stamping techniques. 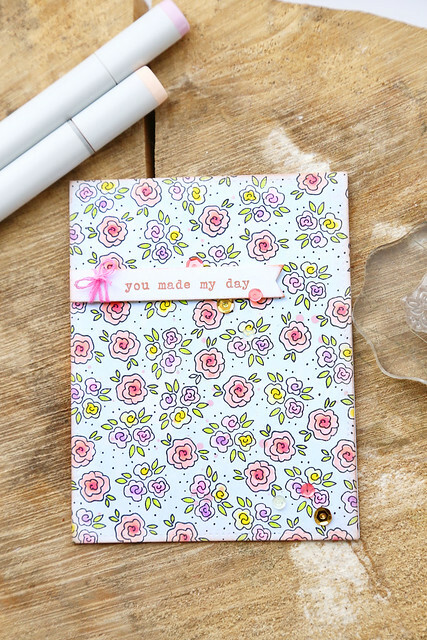 I used 2 little flower stamps, both from the new Sweet Treats stamp set, to stamp an entire card-front. The 3-flowered-cluster image had little black dots around the flowers, so I used a black pen to add more dots at the end to fill up the space. I then used copic markers to color in the florals. I used pinks for the larges flower and colored the trio in violet, yellow and a lighter pink. The entire background got colored as well, in a soft blue/grey. 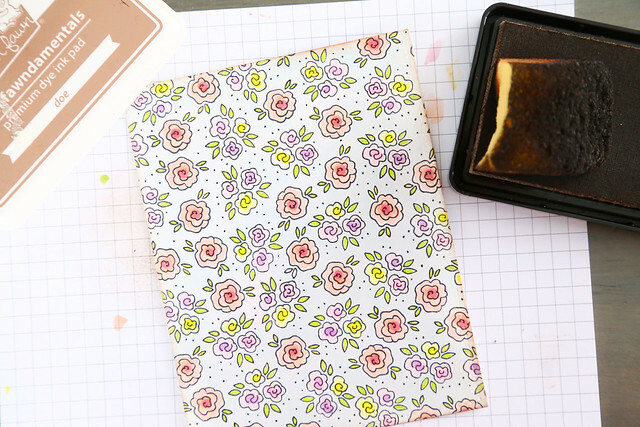 My favorite patterned papers are the ones that look a little vintage. So, to bring a bit of that quality to this paper I shaded the edges with a soft brown ink. As a final touch, I used the same brown ink and flecked it onto the entire area. Yeesh! My brush is in bad shape, haha. I hope you like my little tutorial. 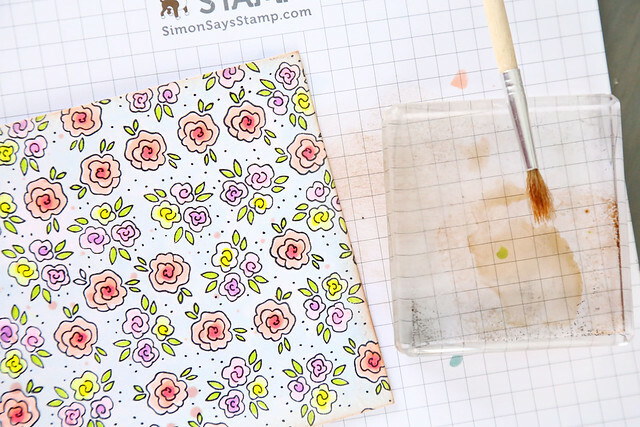 It's fun to see what you can do with the smaller stamps in a set! 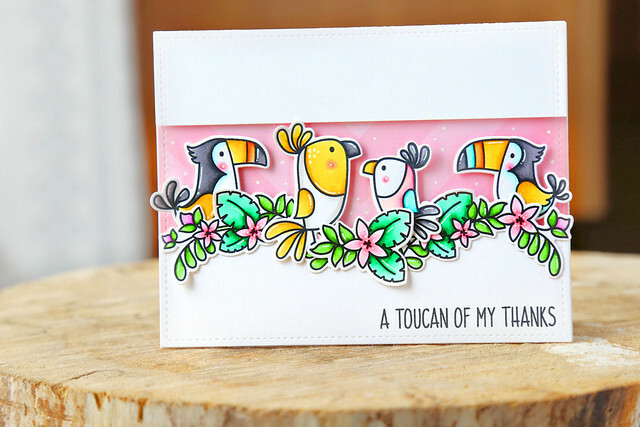 To end off, I added a sentiment from another new set, Bird With Flowers, and some bling by way of a few sequins. All you have to do to be eligible is to leave a comment on each one of the participating blogs! Comments will close at 11:59pm PST on February 26th and the winner will be announced on the 28th. Good luck! 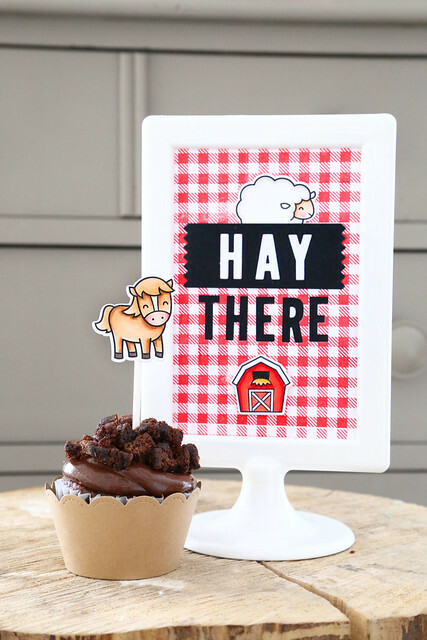 I cut the basket out of new Gotta Have Gingham paper, and added a Hay There sheep to the front. My Maia goes bananas for everything sheep-related so this one made her giddy. 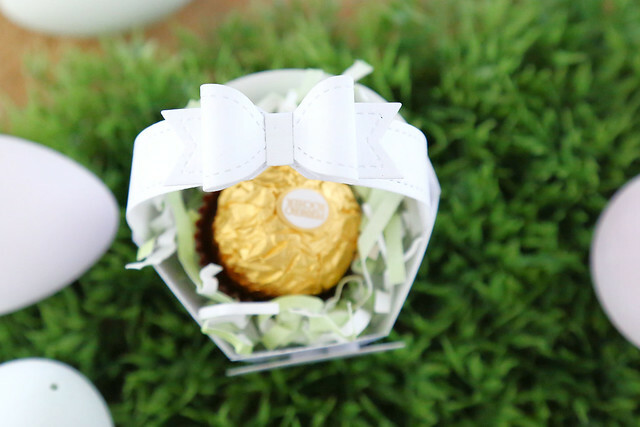 With just enough space inside for one yummy little chocolate truffle. The paper bow at the top is so cute! I'm running a little behind so I'm giving you a 2-for-1 blog posting deal today. Our family took a little trip to Vermont this weekend in celebration of my 40th birthday (it doesn't even feel real to type that!) and I took a little blogging break yesterday. 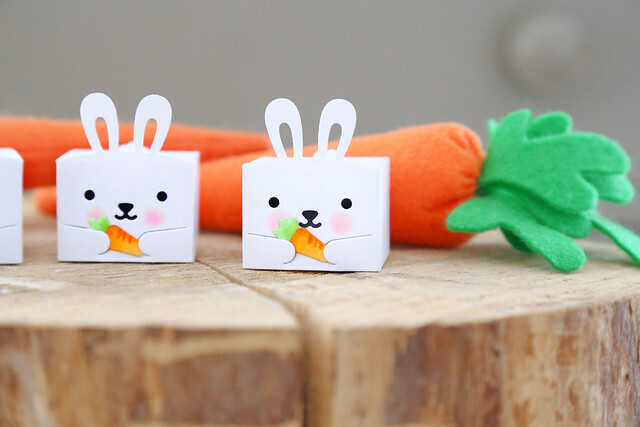 I used the little bunny-costumed kid from Easter Party, and gave him a carrot garden using images from Some Bunny. 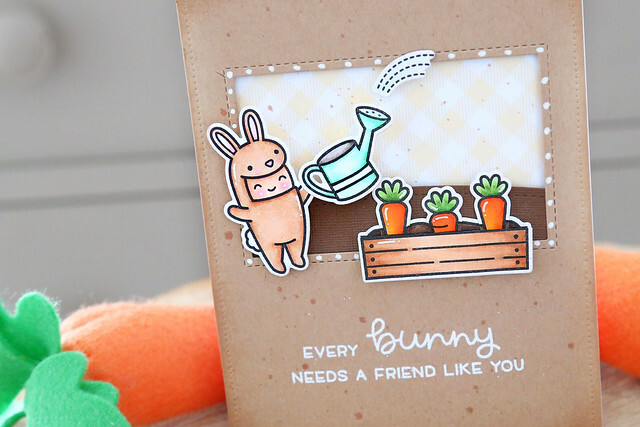 It all made for a very cute Easter-themed friendship card! I gave the scene a yellow gingham sky, and drew in the missing lines from the carrot garden images to make everything look more seamless. 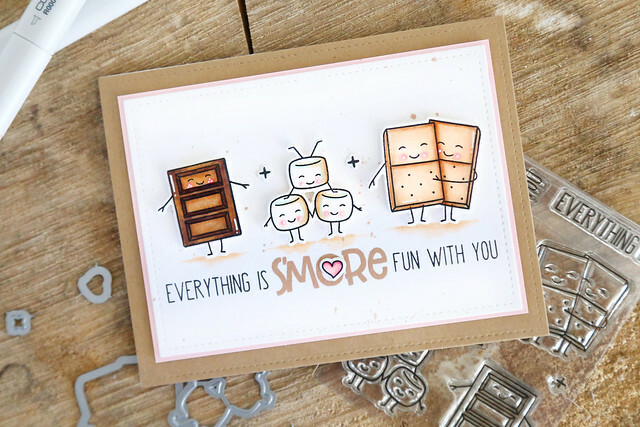 I white-heat embossed the sentiment and used a white gel pen to add accents to give the card more "pop." The tiny gift box is already one of my faves. I love a small treat box that cuts out in one piece and that holds just a small amount of chocolate. ha. My kids would love more but one piece looks special in a dressed up box. 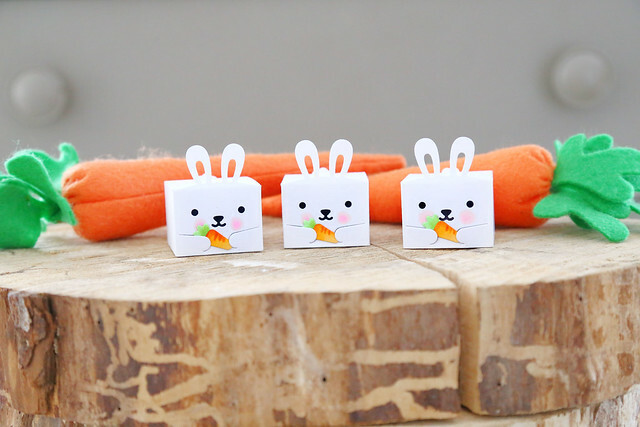 The bunny add-on dies are so cute! 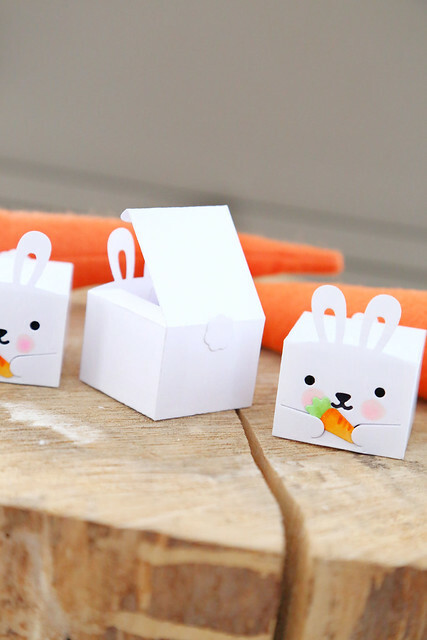 The bunny shape cuts out and then you could use an extra die to make arm cut-outs. I mean, c'mon. So stinking adorable! And then give him a carrot or an easter egg to hold. I die. The rosy cheeks just push it all over the top. As does the little cotton-tail bum. I love it too much! There's more to see this morning on the LF blog - click! 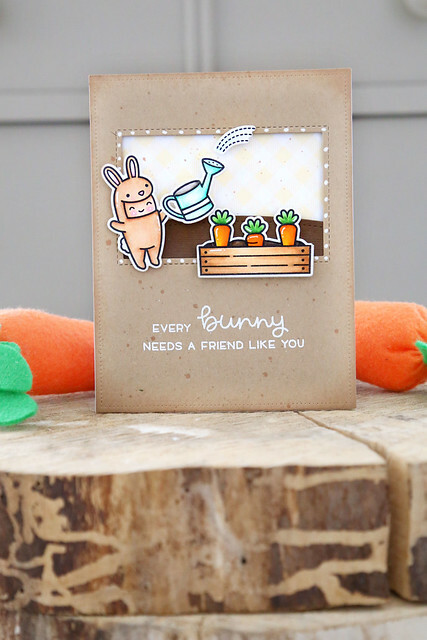 Hi there, and welcome back to the 2nd day of this month's Lawn Fawn inspiration week. 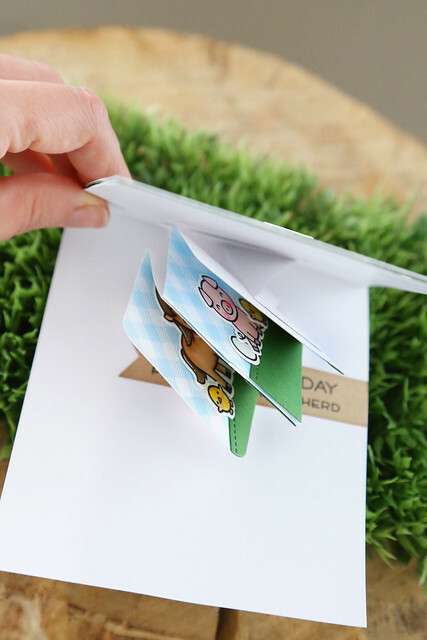 We're showing off a very fun new interactive die, the Pivot Pop-Up. 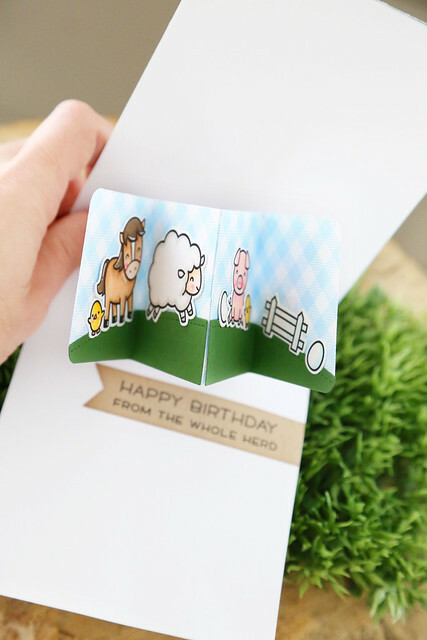 This die set includes everything you need to create a 4-panel scene that twists and pops-up as you open the card. I started out by decorating the outside of the card. 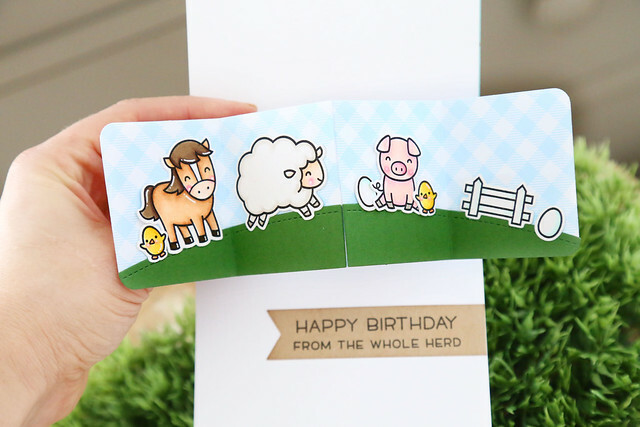 I used images from the new Hay There stamp set, nestling them into rolling green hills. and unfolds into such a fun surprise! I didn't anticipate loving this die as much as I do, but the kids and I took turns opening and closing the card for quite awhile. I kept it pretty clean-and-simple, letting the pop-up panel shine, but next time I'd love to go all out like some of the other girls on the design team did. 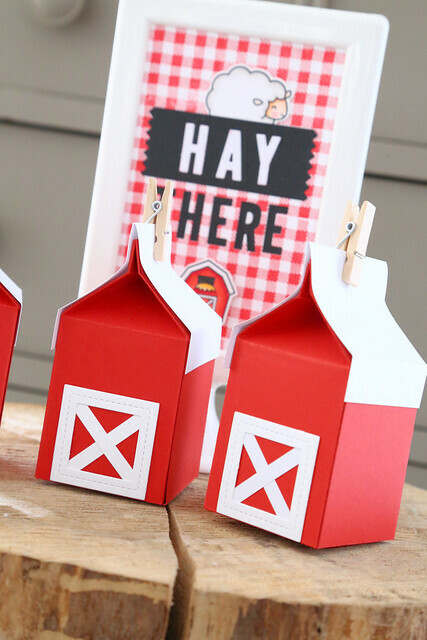 Check out all of their amazing creations on the Lawn Fawn blog this morning - click! This set is one of my favorites from the new release. 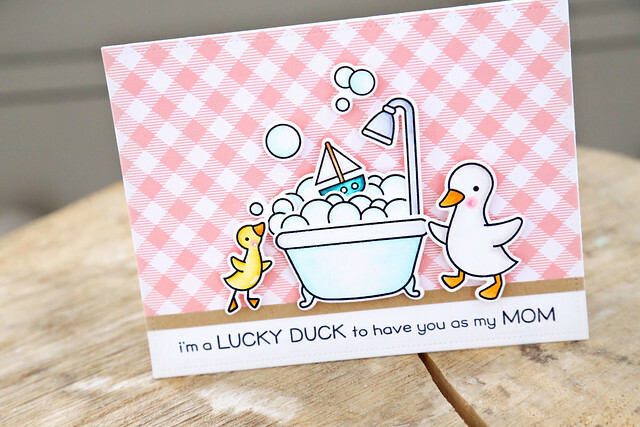 I adore the little duck peeking up over the top of the bubbles to see his little toy boat! I doubled up on the bubbles and tucked that little ship in between. 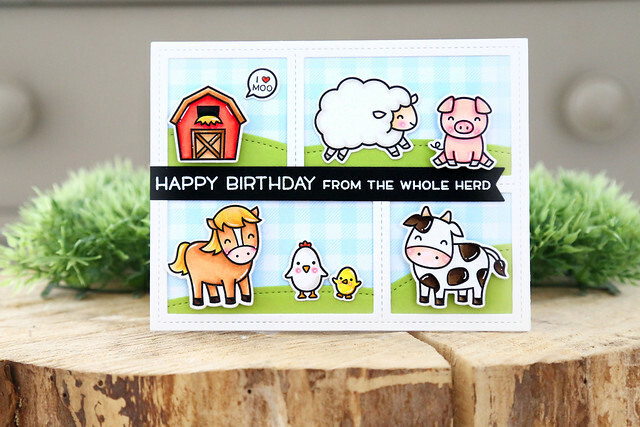 I used some new Gotta Have Gingham patterned paper to make this card come together quickly, and left room at the bottom to stamp the greeting. It almost looks like a fun wallpaper! I love the sentiments in this set, the whole concept is so fun and fresh. 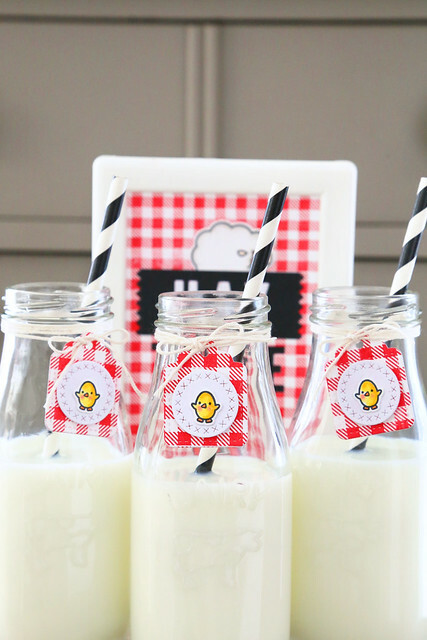 There are more ducklings to see on the Lawn Fawn blog this morning - click! 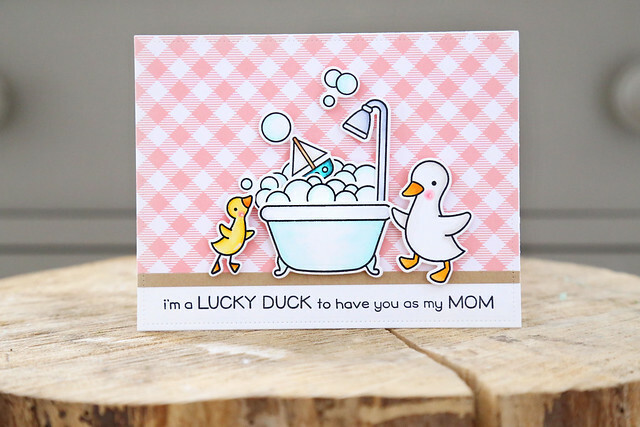 Hi there, and welcome to Avery Elle's Spring release blog hop! Isn't it so fun? 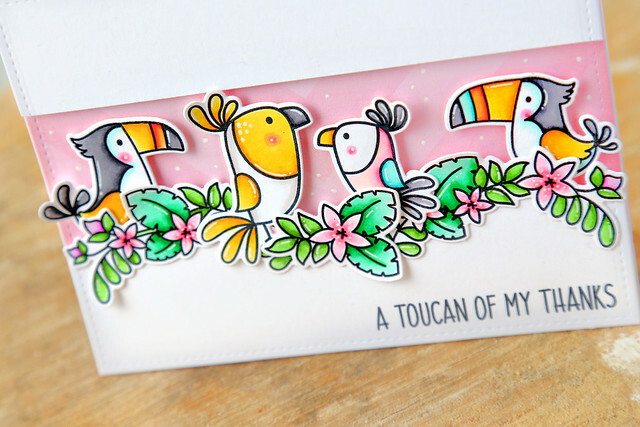 I love all of the birds as well as the floral/leafy elements. It's such a well-designed set! I colored the birds in quirky colors and set them up against a pink chevron background. I drew in some dots with a white gel pen and framed out the focal image strip by adding white cardstock to the top and bottom. The leaf/floral images added some drama, and I stamped the greeting in a dark grey ink at the bottom. To celebrate our spring 2018 Release Blog Hop, Avery Elle is giving away a $25 Gift Certificate to one random winner. To enter to win just comment on this post. There is no purchase necessary and you must be 18 years of age or older to enter. This giveaway is void where prohibited. You can also do options 2, 3, 4, 5 or all 6 of the following to increase your chances of winning. You have until midnight Sunday, February 11th to enter. The winner will be announced on the Avery Elle Blog on Monday, February 12th. All products are available for purchase in the Avery Elle store right now. It's the 4th day of this month's Neat and Tangled release week. Everything will be available for purchase in the store tomorrow morning, 8am EST. 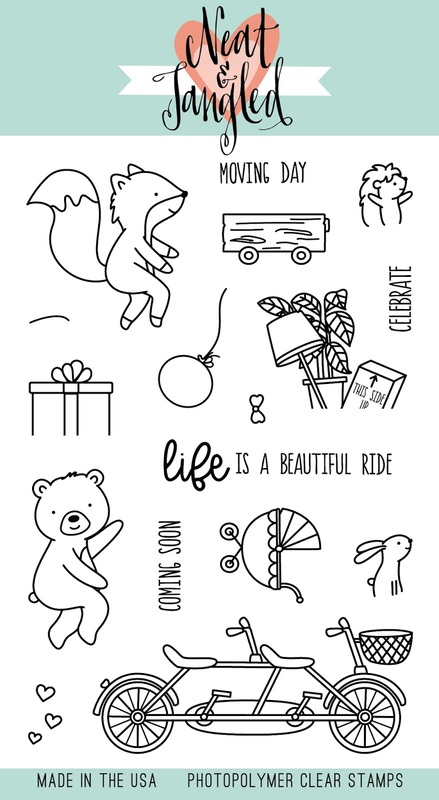 They've been available for some time as a digi stamp in my Etsy shop (which is sorely in need of new images! ack) but now I'm thrilled to be able to have them in my collection as stamps. This card is so simple, but so fun. I stamped out the images, die-cut them and stamped out the sentiment. Doesn't get much easier than that! 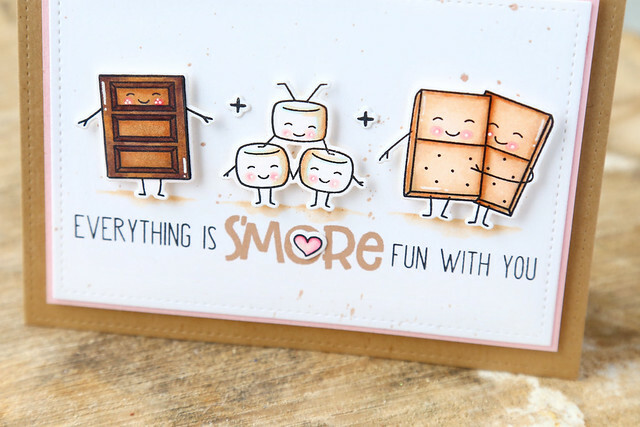 I added a little bit of shading under each s'mores component and placed the heart on the O of S'more. 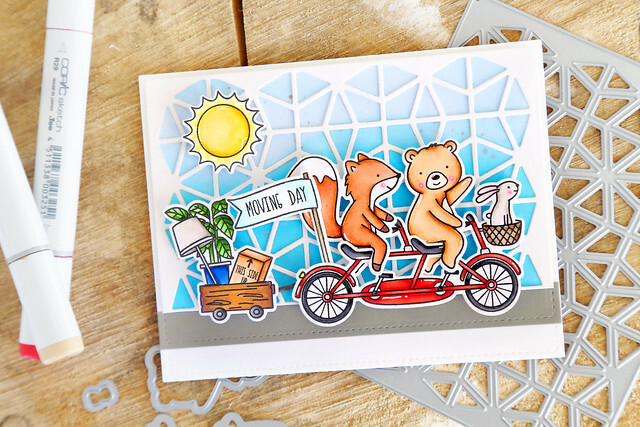 It's day 3 of this month's Neat and Tangled release week, and we're showing off more goodies designed by Miriam: the Geometric Circles cover plate and stencil. Like I did on Monday's card, I borrowed the little flag from Beach Day, and this time the sun as well. I ink blended a piece of white cardstock in shades of blue, and then splattered soft brown ink over-top. The coverplate was trimmed down a bit so that it fit the upper portion of the card. I cut a strip of grey cardstock to simulate the road. The coverplate gives it a bit of a retro vibe, no? I filled up the wagon with the moving day image, and joined the wagon to the bike with some grey twine. Don't forget to leave a comment before you go - a winner will be chosen at random from the design team blogs. On Friday, you could be the winner of a 25$ gift card to the Neat and Tangled store. Good luck! 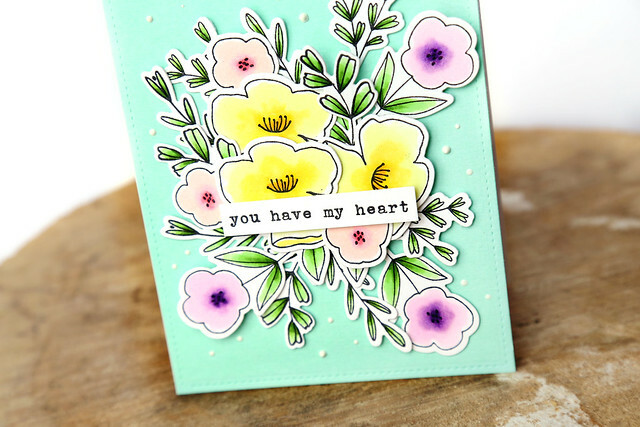 I used Fleur 1 and Fleur 2 from the most recent release for all of the blooms. They work so well together! The sentiment is from Bird With Flowers. I trimmed it out and adhered it with foam squares to give it a bit of a lift. 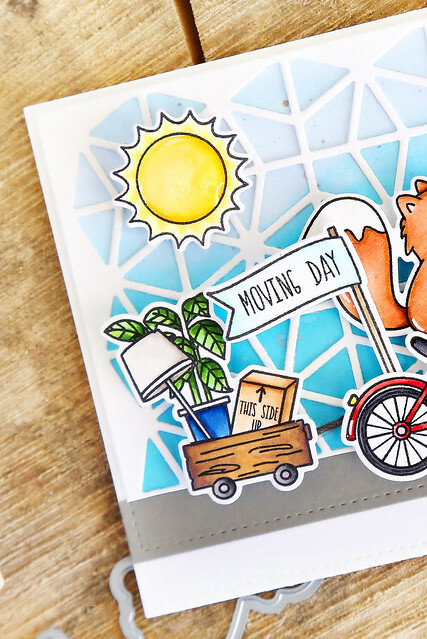 It's day 2 of this month's Neat and Tangled release week and we're highlighting the new Panda die and So Many Sentiments stamp set - both designed by Miriam Prantner. This is the quickest card I have ever made, and the kids kept trying to steal it. They cut a few panda faces for themselves too. 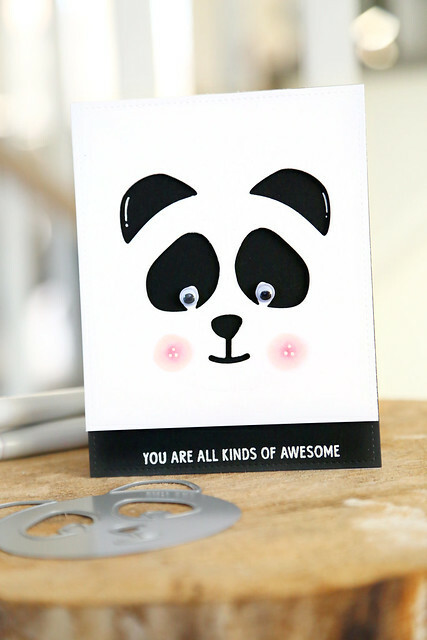 I die-cut the panda out of white cardstock, and then used foam adhesives to glue it onto a black layer. Instant panda face. I added some googly eyes and rosy cheeks and white gel pen accents to dress him up a bit. The little cheeks are so cute. 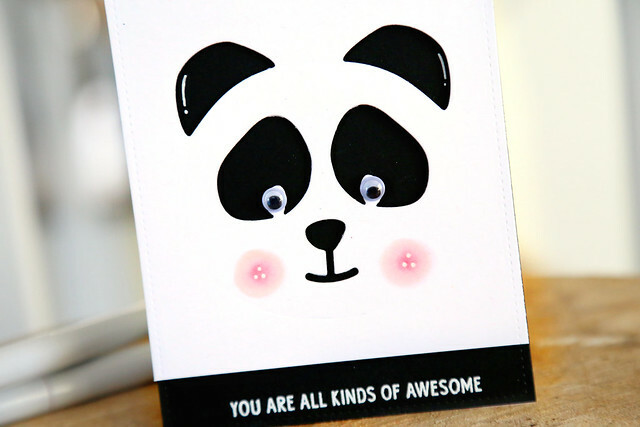 The sentiment, from So Many Sentiments, was white-heat-embossed to keep with the black and white panda theme. I'm excited to kick off this month's Neat and Tangled release week with a look at my newest set, Ride With Me. 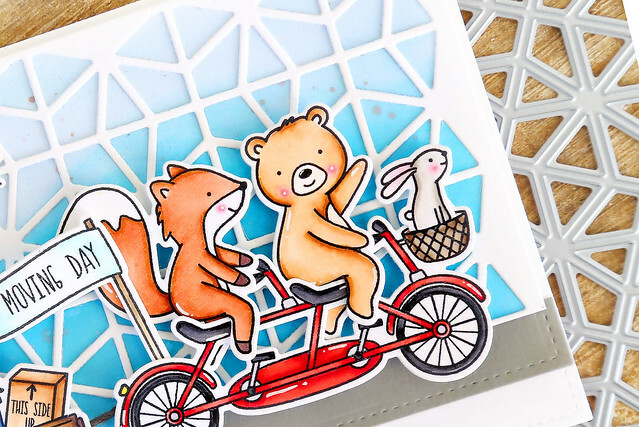 The 2 main critters can be die-cut to fit directly onto the bike, and all of the accessories allow you to create for a few of life's big occasions. 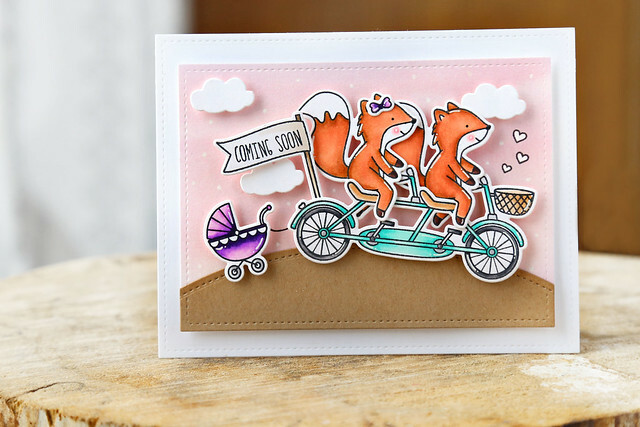 I love the teeny hedgehog and bunny the most - they can fit into the bike's basket or be pulled behind in the wagon. 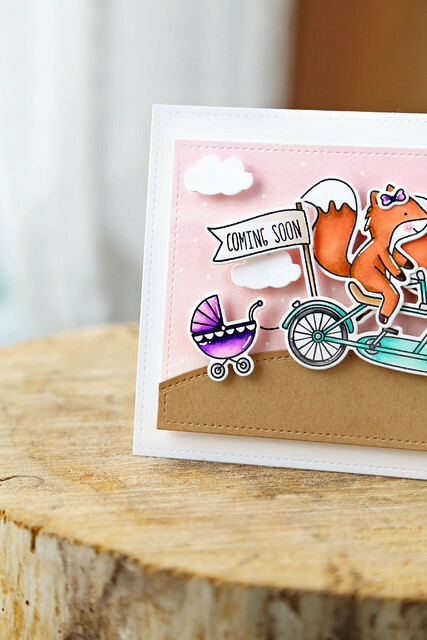 I used the fox to create a little baby announcement card. Isn't it so sweet? I borrowed the flag from Beach Day and stamped the greeting inside (all of the supportive sentiments fit so well in there!) and gave the foxy mama a little bow in her hair to match the baby's purple pram. 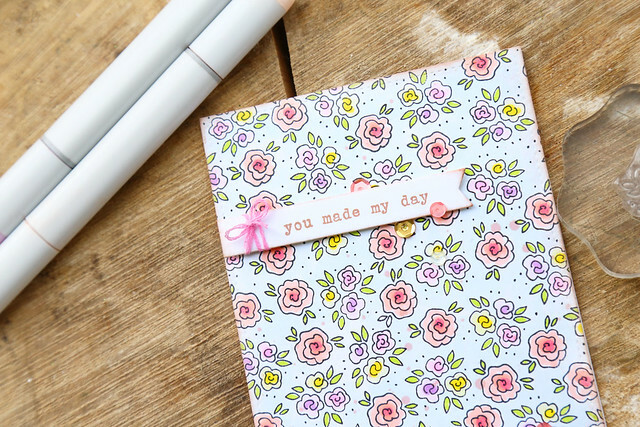 I used a sheet of Lawn Fawn's Watercolor Wonder paper for the unexpected pink sky, and added little white gel pen dots to lighten it up. The clouds are from the Making Waves die set, and make the sweet scene even more so. I hope you like it! Don't forget to comment on all of the design team blogs for a chance to win a 25$ gift card to the NT store at the end of the week. A winner will be chosen at random from all of the blog comments. 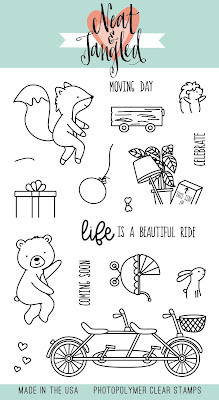 Danielle is also giving away a Ride With Me stamp set on the blog this morning, so check it out - click! Say hi to Dog Lady and Cat Lady! 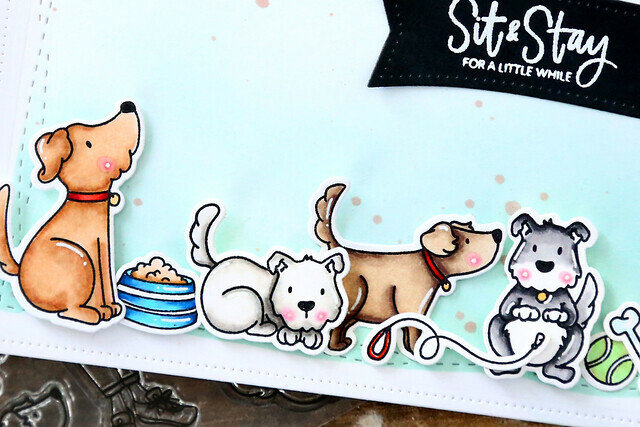 I stamped and colored the doggies from the set, and lined them all up at the bottom of my card. Behind them, I did some very subtle blue ink blending, and splattered it with some soft brown ink. Isn't the sentiment perfect? They all look like they're expecting something to happen. ha. Sometimes it just takes a little patience! The 2 kitties on the left look like they did a naughty thing, don't they? They're handing their cat-mommy a little prize. 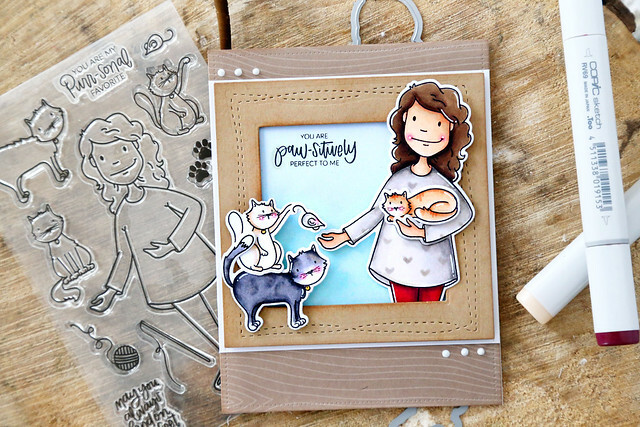 I love how the set was designed so that the die cuts around the lady's hand so she could cradle her cat. I colored her sweater and then used a slightly darker grey marker to add some tiny hearts. I would totally wear that outfit around the house!